Brain Peak Review: Is Brain Peak a Scam or Legit? Brain Peak is a supplement which contain a balance of vinpocetine and huperzine which primary purpose is to boost acetylcholine levels in the brain that improves cognition and other brain functions. This supplement is claimed to improve memory, flow state and processing speed of the brain while improving dreams and revitalizing the mind. This works by the increased blood flow in the brain as the effects of taking this supplement. Aside from that, there is also an improved oxygenation. There is also an improved prevention of free radicals because of its neuro-specific anti-toxins. The manufacturer of Brain Peak hasn’t provided any information about themselves nor provide you with enough information for a better buying decision. There are no available information on the internet about the company, however, there are products with the same trial guidelines and almost the same customer service numbers except the last digit like Alpha XTRM which can make us conclude that they are manufactured by the same company. There are not much information about the ingredients of Brain Peak even in their website however it has been said that it contains huperzine and vinpocetine. Huperzine: Is known to possibly effective for improving memory especially in Alzheimer’s disease patients. It is also used for those who have related problems with memory loss. Vinpocetine: On the other hand, has been known to improve blood flow to the brain which has a positive effect on brain memory. The increased blood flow also improves oxygenation in the brain. Though both ingredients are known to be effective but there is no enough information at how much are contained in Brain Peak thus it is still in question to whether or not the amount found in the supplement is enough to be very effective. It contains 2 of the effective ingredients for improving brain’s health and memory. It comes with a 10-day trial for $4.97 only which you can return and cancel your subscription if you are not satisfied with its effects. They offer a refund with phone number. You can find their phone # in the product’s website. There is not much information about the manufacturer. Ingredients are not listed and there is no amount stated for the main ingredients. After the trial period, the monthly subscription is expensive at $139.97 plus $9.97 for the succeeding months plus another 35% for the restocking fee. 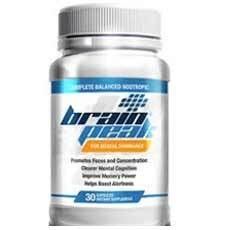 Brain Peak does not come with serious side effects based on the reviews and customer’s feedback. However it comes with some minor side effects that can be commonly experienced for those who are taking this supplement. If any of these side effects occur, it is recommended to talk to your physician as soon as possible. Brain Peak comes with a 10-day trial period for $4.97 to cover shipping and handling charges. With this, you will receive a 30-day of supply. You can stop this trial period anytime before the 10 days end. When your trial expires, your credit card will be automatically charged with $139.97 which is the price for a month of supply. You will be receiving monthly supply of Brain Peak for $139.97 each plus $9.97 for shipping and handling fees. You have 30 days to cancel and return the product if you are not satisfied. You can request for a refund by contacting 855-511-2191. Brain Peak is not for those who are under 18 years of age but fit for those who are above 18 and are experiencing from memory loss and brain related problems. It is not also advised for intake for those who are lactating or pregnant. If you are undergoing medication, you should consult your doctor before taking Brain Peak. Some report that they find good results with regular intake of Brain Peak. Their dull cognitive performance was improved with regular intake of this supplement. However, effects may vary depending on the level of brain problems a certain individual has. Will it unlock your potential? This is the question which can’t be answered concretely because people who have used this supplement has different experiences. With the lack of enough information provided by the manufacturer about this supplement, people may think that this is a scam but because of the 10-day trial period and refund policy they have we can safely say that it is worth a try. For as long as they respond or answer the phone when you give them a call for a complaint or refund request, then that won't be a problem.